2017 has been a very busy year for our company; so much so that I have been behind on updating our website. The Farmers Market season has been very active for us this year with the addition of our first season-long presence at the Linden Hills Market in Minneapolis, after our dry run last October. 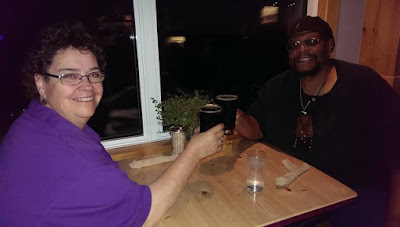 Of course, we are having a great year at our "home market," the Midtown Farmers Market here in South Minneapolis, and a presence early in the season at the Richfield Farmers Market. As the season went on, through the recommendation of a fellow vendor at the Blaine Winter Market, we are now a part of Home Essentials Boutique. It is a "one-stop shop" for seasonal furnishings, furniture, one-of-a-kind gifts and gourmet foods. Home Essentials is proud to feature Made in Minnesota products, and has become known as the place to go for Holiday and gift shopping; so much so that it has become one of Minnesota's most popular shopping destinations, with tour buses routinely stopping there, with enthusiastic shoppers marvelling at the wide variety of products that are available. If you are looking for that perfect gift for yourself, for the family, or for that special someone, Home Essentials Boutique has what you are looking for, including all three varieties of Winter Goddess Food's Organic Granolas and Aww Nuts nut mixes. We have also introduced our new 4oz. snack sized Aww Nuts Snackers (in Classic or Slow Burn) which we made specifically for this venue, which you will find at the checkout register. In July, after impressing Greg and Chelsea Miller, owners of the popular Kabomlettes food truck that roams the streets of the Twin Cities, Terry was recruited as the new baker for their full-service deli Vittles, in south Minneapolis. Terry now serves up her wholesome baked goods to an even wider audience, along with a wide range of specialty pastries and treats made without artificial ingredients or additives. Unfortunately, with the added demands and responsibilities, she had to end her time at the Richfield Farmers Market due to time constraints. On the plus side, Terry is making a name for herself in South Minneapolis with her baking prowess. In a related note, due to Terry's relationship with Vittles and Kabomlettes, Winter Goddess Foods has partnered with them to do dessert catering, which has been one of her dreams. So far this year, we have catered events for the Ann Bancroft Foundation, the grand opening of the new Hennepin County Service Center in South Minneapolis, as well as several events for the Minneapolis Urban League. 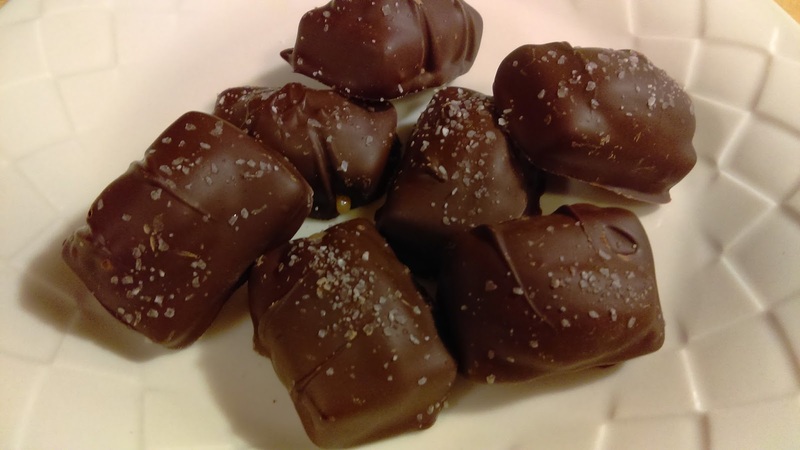 Terry is also gearing up to accept orders to create tasty cakes and pies for the holiday season, as well as her organic chocolate truffles and buttercrunch toffee. In addition to all of this, Winter Goddess Foods will continue to provide employers and business owners with an opportunity to celebrate their employees through our Corporate Gift giving page. We are working hard to provide more offerings for employers to choose from to honor their workers with. With the Farmers Market season entering its final month, our company will be participating in a number of shows and Holiday events throughout the Twin Cities area during the Fall and Winter. Over the last two years, we have had a more active presence on our Facebook page. 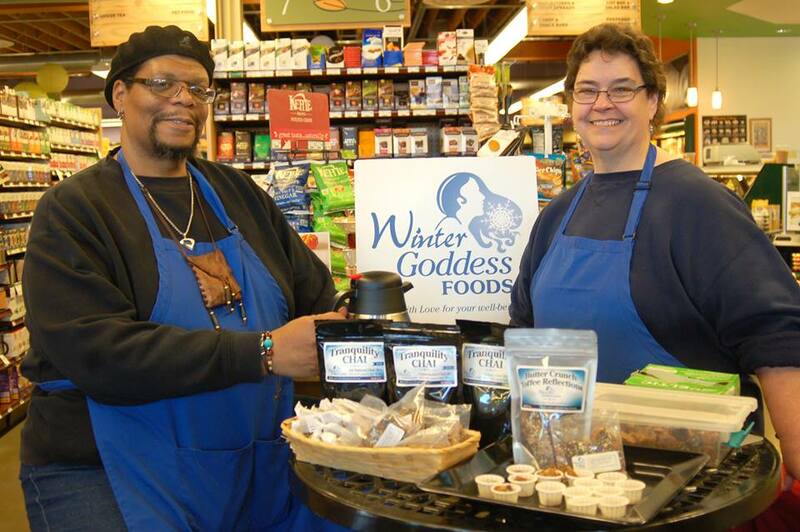 If you are looking for up to the minute news about Winter Goddess Foods, our events and where you can find us, I highly recommend that you go to our Facebook page here. Finally, on a more personal note, I have realized a life dream of becoming a published author. 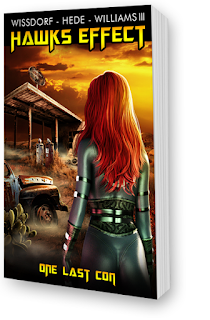 In May, my co-authors and I have released our first serial novel - Hawks Effect - in Europe. We have secured U.S. distribution of our series, and by November, both episodes one and two and all subsequent episodes will finally be available to United States residents and worldwide as well. You can read and follow our exploits here and here. Thank you all for hanging in there with us! After the hustle and bustle of the Holidays, Terry and I have dialed things down to a bit more low key. Business goes on as always, but we are now taking a bit more of a relaxed approach to life these days. Since we are between both Holiday and Farmers Market seasons, we have a little more time on our hands. Besides the mundane tasks of doing paperwork, and going over our business needs, we find ourselves with time to experiment with new ingredients and new ideas for making even more yummy products to delight your taste buds with! This is our FUN TIME! Change is an inherent part of life. In life, in order to get yourself in a better place physically, mentally, and even spiritually, we have found that the best way to accomplish this is to remove anything that doesn't serve you and to move forward by making the choices that suit your needs in a good way. Business, just like life, deals with change on a daily basis. And just like in life, the best businesses remove what doesn't serve their needs, and replaces them with new offerings that are more in line with their vision. They also satisfy their customers by responding to their needs and requests as well. With that in mind, we have both good news and sad news to report to you, our Peeps. 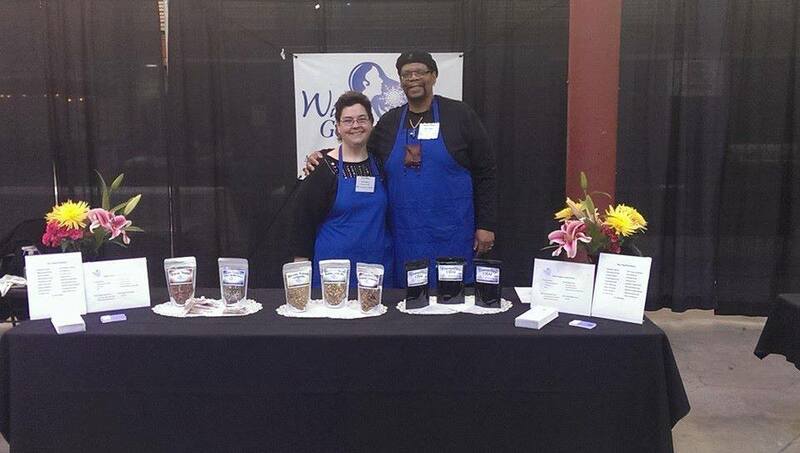 Starting with the sad news, Winter Goddess Foods is saying goodbye to both of our organic cocoa mixes. 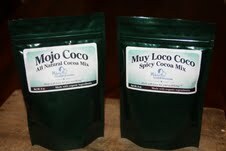 Mojo and Muy Loco Coco will no longer be produced or available online or at any of our outlets or venues. Both chocolicious hot drinks were dynamite products, but due to various factors, failed to find a regular audience. We are sad to see them go, but as the saying goes, "Life goes on." Goddess! Butter Crunch Toffee, which more reflects the description of (and our fan's reaction to) our delicious product. Both our savory Organic Wild Rice Bread and our spicy Aww Nuts! Slow Burn will sport new labels as well. 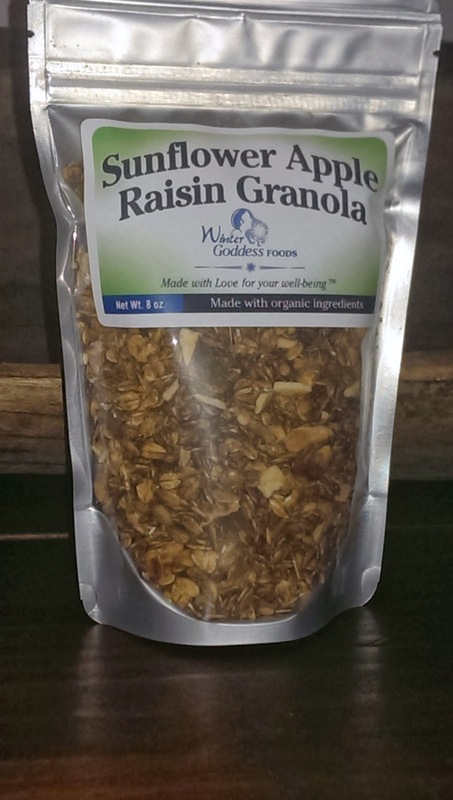 In response to our customer's needs, we will be offering a 16 ounce version of our nut-less Sunflower Apple Raisin Granola, which will join our full lineup of both 8 oz. and 16 oz. packaged granola's. The new labeling is being produced as we speak, and we will introduce it officially at the Midtown Farmers Market in May! 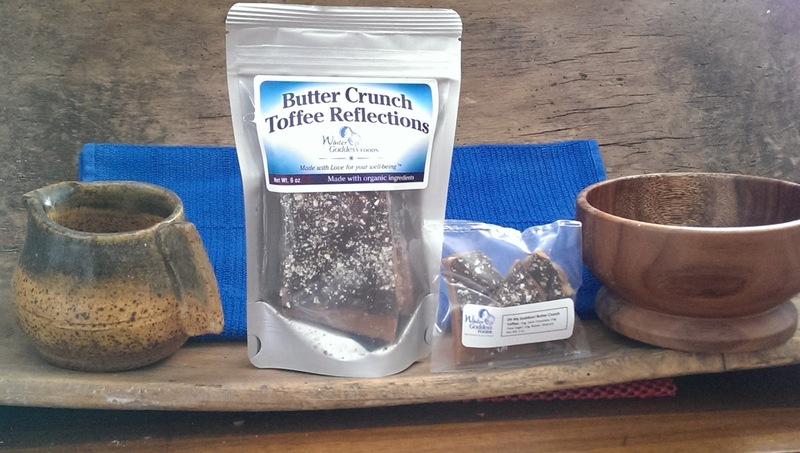 And now, we are introducing two new offerings to the Winter Goddess Foods family! Also, in response to our fans who are Chili-heads, and who have requested more "umph" in our sweet and savory nut mix, your prayers have been answered. While our Aww Nuts Slow Burn has enough heat to satisfy most folks, there are some of you out there that wanted (and NEEDED) more spice. 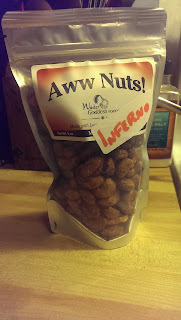 I have been in the kitchen trying to develop an even spicier version of our Aww Nuts that will satisfy both the need for great taste and the need for more heat, and I believe I have nailed it. On Saturday, January 28th, I will be doing test marketing and sampling of my newest creation: Aww Nuts INFERNO! I have made a limited run of 8oz bags of this fiery taste sensation specifically for the Blaine Farmers Market this Saturday. If you are a true Chili-head, and you are lucky enough to live in the Twin Cities area, please stop by for a taste of our "friendly fire", and let me know if I got it right. For the rest of you, I plan to make this available online as soon as all testing, sampling and fine-tuning are completed. Stay tuned! I am also in the midst of creating another tasty treat, but I am keeping things under wraps for now. Suffice it to say that if I can get things to my liking, we may be introducing yet another product by Farmers Market time. 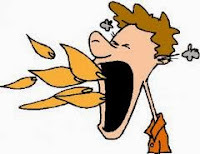 Please check out our page on Facebook for the latest goings on of Winter Goddess Foods. Thank you for your support, and we wish you all opportunity and prosperity as we swing into 2017 in earnest!